punchcamp-spain has designed this martial arts camp especially for managers who wish to recharge their batteries or just de-stress. Take the challenge of their exclusive martial arts personal training program to get fitter, stronger, find peace, learn self-defense, feel relaxed, and happy with a master of martial arts on sunny Costa Blanca, the pearl of Spain. For bookings in spring and winter season, the accommodation will be in a four-star hotel resort just two or five minutes away from the gym. For bookings in summer and autumn season, the accommodation will be a combination of a four-star hotel resort and punchcamp-spain eco country house in the mountain of Aitana. All the facilities will have a private room with private bathroom with a fantastic view to the mountains or to the sea. 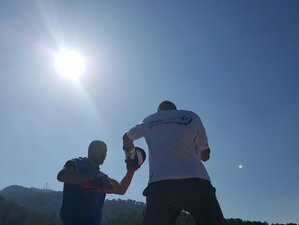 19:00 Special Martial Arts techniques and conditioning training with the head coach in punchcamp-spain gym or in their boot camp. Excursions such as city sightseeing, visit to National Park, mountain hiking, quad biking, swimming at exclusive beach, canoeing, kayaking, jet ski, and much more are included in the price. This martial arts training camp will take place in Costa Blanca, Alicante, Spain. You will train in a martial arts gym near the beach of Albir and punchcamp-spain’s own open air boot camp site in the mountains of Guadalest with more than 400 challenging exercises. All meals will be based on Mediterranean cuisines and will be using organic and locally sourced ingredients from the punchcamp-spain farm house. All the spa treatments are included in the package price. You may have traditional Thai massage and physiotherapy at the spa center. Please book your flight to arrive at Alicante-Elche Airport (ALC). punchcamp-spain will pick you up from the airport. The pick-up is included in the price.